You often hear us talk about Rosh Chodesh, where once a month you gather around a table and share a meal with friends and family and just talk about the goodness of God. Interestingly enough, the table is a way to connect with those around it. You sit and talk and connect to your family and friends.It’s not even just about inviting your friends to the table, it can be your family. Families that eat dinner together have a stronger bond than those that don’t. Don’t feel pressured to have a huge gathering. 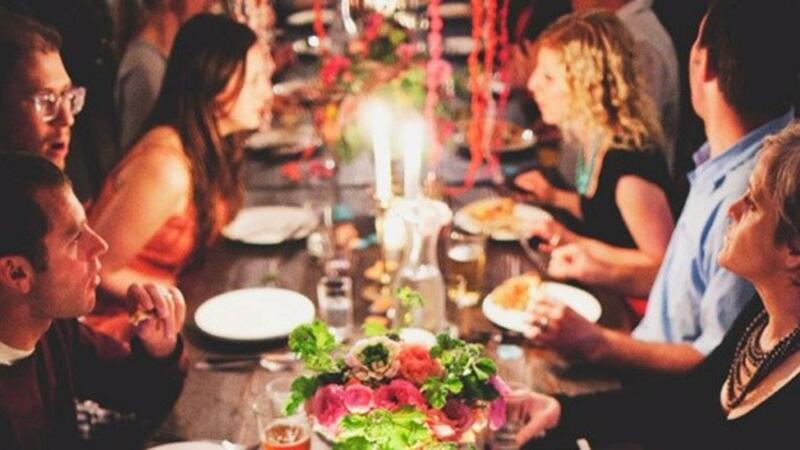 Rosh Chodesh can be the people in your home, once you’ve mastered that, you can start inviting others to your table. When you think about big family gatherings, there is usually food and laughter involved. It’s no surprise then that there is a biblical connection to gathering around a table - in fact, throughout the bible, God has a way of showing up at the table. It’s worth noting that, “When Jesus himself wanted to explain to his disciples what his forthcoming death was all about, he didn’t give them a theory, he gave them a meal.” - NT Wright. Perhaps before we invite people to Jesus, or even to church, we should share a meal with them. If we show them the fellowship that comes with celebrating something like Rosh Chodesh, we can show them what it means to follow Jesus. There is the verse in 1 John 3:18 “Dear children, let us not love with words or speech but with actions and in truth.” - the actions, showing love and acceptances at the dinner table is going to bring more people to Jesus that someone preaching on Sunday. We live in a very tech oriented world. It’s important to disconnect from the fast-paced word and reconnect with your family and friends. Rosh Chodesh is not only an excuse to have a party with your friends and family, but it’s also a way to disconnect from the nitty-gritty and just enjoy a meal and some conversation with people. There is something very spiritual about sharing a meal with someone. It says in Matthew 18:20, “For where two or three gather in my name, there am I with them.” The great part is, the table acts as a unifier, it almost forces a sense of community. It breaks down walls and invites communication and through that you’re able to really show love, as Jesus would have. In John 6:35, Jesus says, “I am the bread of life,” Jesus told them. “No one who comes to Me will ever be hungry, and no one who believes in Me will ever be thirsty again.” Jesus wants to be with us always. He wants to be a part of our meals. He wants us to invite him into our homes and make him a part of every single aspect of our lives. Let me ask you this, when was the last time you sat down with your family and had a meal? The answer is going to vary depending on your family situation and your schedule. What about the last time you had lunch with a few of your friends? Now, when was the last time you sat down to a meal with the intention of it being a spiritual experience? Where you invited Jesus to the table and spent the time really involved with your family and the Lord? That’s what Rosh Chodesh is truly about. It’s about having a meal with family and friends and inviting the presence of the Lord in. Now, have you connected with a House of Light? We’re really encouraging you to connect with one. It’s great to not only HOST Rosh Chodesh but ATTEND Rosh Chodesh. We have zone pastors in place that are here to connect you to your church family. You’ll be invited to a dinner once a month to fellowship with people who are expecting the presence of the Lord to come! If you’re not already connected,visit this page, and get connected. It’s nothing scary, it’s not a huge commitment, it’s one meal, once a month. I promise you’re not going to regret it!